Inspiration for table settings can come from a variety of sources. I didn't decide which dishes to use today until after I'd taken a stroll through the garden with secateurs in hand. I returned with a bucket filled with colorful cut flowers. The loosely-structured arrangement of oak leaf hydrangeas, roses, Anthony Waterer spirea (pink bridal wreath), Stella d'Oro daylilies, Japanese painted fern, Jacobaea maritima (common name, dusty miller), and variegated vinca reminded me of my new set of "Joyus Garden" dishes (pattern J5946) by Emerald Collection. No, the flowers aren't the same, but they seemed to me to share a colorful exuberance. I think there's a risk of creating a chaotic effect, a sort of visual overload, when combining bold, busy china patterns with mixed floral/"English Garden" style centerpieces. To create a simple background, I covered the table with layers of white cotton battenburg cloths. I decided against adding formal silver or crystal candelabra. The pair of single candleholders I used have a stylized, tropical look. They're metal with a dark patina. Small stainless sherbet dishes hold floating, faux-flower candles. Again, to offset the busy patterns of the dishes and centerpiece, I opted to leave what would be considered "white space" if this table setting were the layout of a printed page. 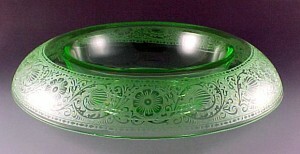 The stemware could be used for wine or water. The pattern is Marquis by Towle. The simple cotton napkins are casually presented in the glasses. I'll admit that I've never actually offered guests their napkins in drinking glasses. I've certainly seen it done in restaurants, and I don't dislike the effect; I just don't do it. It seemed appropriate today, because I wanted the dishes and the tablecloth to remain as uncluttered as possible. For people who like things more structured, there are beautiful napkin folds for tucking neatly into glasses. I wanted these to look spontaneous (the same approach I used while arranging the flowers). The vintage, silverplated flatware is by Wm. Rogers, "Triumph" (1941). 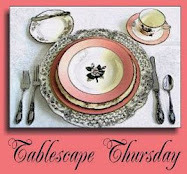 Please join Susan of Between Naps on the Porch for Tablescape Thursdays! It's a great place to enjoy friendly fun, wonderful cameraderie, and divine inspiration! What a beautiful table setting. I love the lavishment of the cloth and your use of Spirea in the bouquet. It makes a great cut flower, but you don't see it used very often. Another stand- out tablescape! Lovely blooms for a cheerful setting! Love the beautiful china! Hi, missed you not posting for a few weeks but I know you have a busy life but what a lovely tablescape to come back with. The flowers from the garden are wonderful and I love the descriptive name of each one. This seems an ideal table to sit at for a Summer lunch in a garden room. The sun and shadows across the table give it great atmosphere. I love the napkins in the glass, the china is very summery and the cutlery (flatware) is perfect. Thank you for sharing your tablescape and I hope we don't have to wait too long for the next one. Take care my dear friend, Jackie in Suurrey, UK. I adore the set up of this! What colours and everything goes so well! A wonderful spring do! so nice to see another of your beautiful tablescapes. The china pattern is absolutely gorgeous and I really love, how exact you stucked the plates. The colors and light effects, the beautiful stemware and the amazing flatware - that's one of your famous tables. And the flowers of your garden are perfect with that. That is a gorgeous tablescape! I especially love the flower arrangement. And the candles. And the napkins. And the flatware. Well, you get the picture! :-) Speaking of pictures, I love how you highlighted the shadows in your pictures of the tablescape. Great job! Wow! That is a gorgeous thrifty tablescape. I love the dishes, what a find! I really like Battenburg lace though do not own any tablecloths, I may have to start hunting them. I like how you used the oakleaf hydrangeas on the bottom of the arrangement. I have a huge bush and have not been able to figure out the best way to display these since they are so large. I am much more casual then formal so this setting really speaks to me. It's simply beautiful! Amazing tablescape dear Bill, amazing!!! Oh MY! Is this not beautiful! I love your new china along with your English garden centerpiece. The sunlight upon your table is just stunning! Good to see you back Bill. Lovely table, Bill. Your flowers are always so beautiful. Absolutely beautiful table. Your floral centerpiece is gorgeous! I love the china. I cannot believe you got it all for $12. What a score!! Hey dear friend Bill,I've missed you and your awesome tablesettings! Love to visit your lovely home,it's a "FEAST" for my eye's!! Wow, Bill, what a find those dishes were! As always, I admire your floral arrangements from your very own garden. This one really complements the dishes beautifully! Bill, good to see you! I've been concerned about you. Hope all is well. ~~Rettabug comes running in to give Bill a BIG HUG & knocks him to the ground~~ Sorry about that but we've missed you!! Can you hear me laughing out loud at the description of that flower arrangement as "spontaneous"???!!!! It would take me hours to achieve such a beautiful, relaxed look! Its gorgeous & I can just imagine what your gardens must look like. Sheer Heaven! The layers of billowing lace tablecloths look like petticoats peeking out from under some grand dame's long dress. Very soft & enticing! The china is very pretty, too. I like the floating flower candles & the way you've left lots of white space around the table. Very smart with such patterns & colors in everything else. Tell me, is an oak leaf hydrangea the same as a lace cap one? They look the same to me. Must investigate. I just planed two 'Everlasting Hydrangeas' & am hoping for blooms all summer long. So far, so good. Hello! I wrote a comment and it was lost! But I am glad to see you back, and this table was lovely, especially the floral arrangement! Some day I'm doing to show up on your doorstep to see these tablescapes in person! This is gorgeous, Bill. You did a wonderful job picking just the right flowers to perfectly accent your china and accoutrements. LOVELY as always. I'm really not blogging again (I tried to last night and paid dearly with the ouchies), but I did want to drop by and thank you for all of your kindnesses to me during my recent ordeal. You are the best, my friend. The absolute best. Beautiful table, and I love those dishes. The flowers are perfect with them I think. How smart of you to use the white tablecloth and let the dishes be the focal point. Bill, your tables are always so beautiful! I love this pattern and how you used it in this tablesetting. Your table scape looks absolutely fabulous. Love the china and the color of the napkins is gorgeous. The candles add a lot to the charm. What a FABULOUS table. So FULL of life and happiness. I am totally in love with this china. How could you possibly gotten it for $12.00??? It brings such life and vibrancy to your home. If you ever want to sell it, please let me know. A stunning tablescape! I am totally in love with your china aaaaand such a bargain! You're so fortunate to find such incredible china for like, almost nothing! Your centerpiece arrangement and choise of flowers is gorgeous and from your own garden!!! This is a happy and perfect summer table. So nice to see your unique and stunning table again and to know you're doing well too. Stunning as always...I've never seen more beautiful china and are the perfect marriage to your beautiful flowers. Hi, Bill! The great price on that china made it all the more "Joyous", I'm sure! What an incredible buy! The flowers you selected are perfect alongside it!!! I had to stop in for a glimpse of beauty and order since I have been living in a cardboard box & bubble wrap nightmare the last few weeks. The truck was loaded up on Tuesday, and we will get on the road Saturday morning with the hope that the truck will arrive by next Tuesday morning. Crossing our fingers and toes on that one! Just wanted to stop in and inhale the gorgeousness here before I resume the cleaning process around here. Fabulous table! Take care, and I'll talk to you soon! So glad you are back! And with such a beautiful tablescape. You need to have some kind of class on thrift/estate shopping, Bill. You always come up with the most incredible finds. And aren't the flowers lovely right now? Here in Alabama the hydrangeas are stunning and I have them all over the house. Who on earth would get rid of that beautiful china? I'm so glad you found it! The yellow day-lilies reminded me of my mother. She loved them and looked forward to going out in her garden each morning to see what was blooming. Bill, I can't believe what you paid for those GORGEOUS dishes. They are wonderful! Your garden is amazing...what a beautiful, beautiful arrangement! I LOVE this table! I was in love with the table to begin with, but when I saw the price rundown, I loved it even more. That table looks absolutely beautiful. I can't believe the price on the dishes. And what I wouldn't give to have your garden and your skill for arrangement. 12 dollars? Get out! They are lovely! The candleholders are really nice too! I agree with Susan -- I can't believe how little you had to pay for these gorgeous dishes! What a bargain!! I love this table. 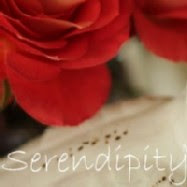 When you do the English-style, mixed flower arrangements, I think they are my very favorites. This centerpiece is no exception. I really like the oak leaf hydrangea and the spirea. I know what you mean about the combination of these colorful dishes and the centerpiece causing possible visual overload. But they don't. You pulled it off beautifully. The dishes and the real flowers complement each other perfectly. The white tablecloths were a good choice, and I love the soft napkins in the crystal stems. The contrast of light and shadow is always captured so well in your photographs. Thanks for sharing! Totally lovely. Great find on the china. Amazing pieces and wonderful arrangement! Amazing! it's so romantic and i love it! great arrangement!